A jacket is not only meant to keep you warm and dry during harsh weather conditions but will also define your style and help you make a statement, especially if you are a biker. 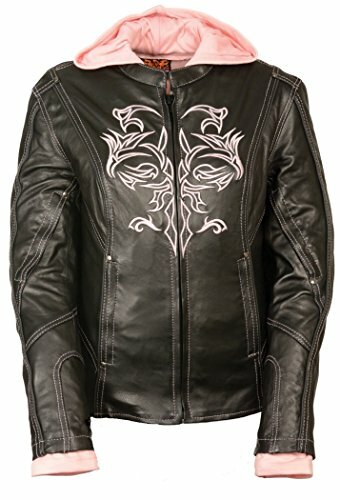 And if you’re looking for the best biker jackets on the market but don’t have the necessary time to go through the entire process yourself, we can help you out. After conducting our own thorough research and documenting the opinion of customers, we concluded that a reliable item is the Milwaukee Motorcycle Clothing Maverick. The item is made of superior-quality leather and is available in larger sizes as well so everyone can get their perfect fit. In addition, it features zippered cuffs and plenty of pockets to store your essentials. And if this product is not available right away, a good alternative in terms of quality and design is the Milwaukee Leather Sporty Scooter. As there are countless cool biker jackets on the market, it would have been impossible for us to tell you all about them. However, we did choose some of the most reliable products according to the customers and showcased them below along with their main features. This product is specifically designed for bikers of all weights and heights, hence it is available in a wide variety of sizes, including 4X-Large and 5X-Large. It is made of high-quality leather that won’t scratch, deteriorate or wear out in time so you can rest assured you’ll be enjoying the same flawless design for many years from now on. The thick leather is perfect to shield your body from high humidity, wind or rain. It comes with a quilted removable liner that ensures maximum protection around your most important pressure points. The zippered cuffs not only ensure a tight fit but will also prevent wind or rain from getting in contact with your skin. In addition, the ribbed waistband helps you adjust the size and fit of the jacket’s sleeves according to your needs. We really liked the fact that the jacket features two large pockets on the exterior and other two interior chest pockets that can help you store all your essentials safely. This product is also available in plenty of sizes, ranging from Small to 4X-Large so you can easily find the right fit for you, regardless of your weight, height or body configuration. However, we suggest you measure yourself accordingly and compare your results with the ones offered by the manufacturer’s sizing guide for the perfect fit. 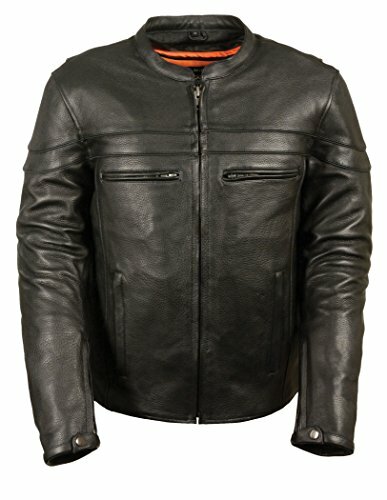 The jacket is made of high-quality milled cowhide leather that is approximately 1.3mm thick, providing maximum comfort and protection against heavy winds, rain, and direct sunshine. Thus, you can wear this jacket almost all year-round when riding your bike. The item comes with arm, back, and chest vents to allow your skin to properly breathe, remaining cool and dry throughout the day, even when facing extreme temperatures. In addition, the reflective piping on the chest, arm, and back area will make the product visible from a distance, keeping you safe in traffic. 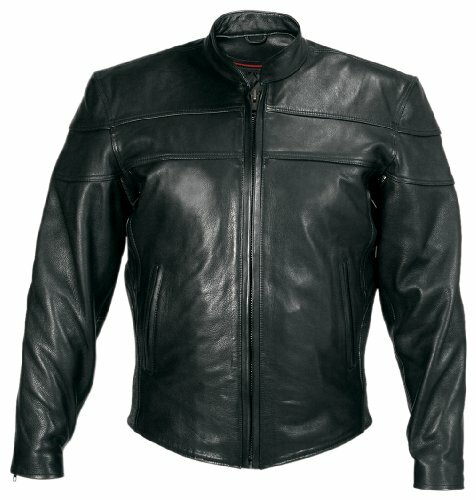 If you’re looking for a woman’s leather jacket to complete your biker outfit, this product from Milwaukee could prove the winning solution. It closely follows the anatomical shape of the female body, ensuring a comfortable fit. It is available in plenty of sizes, ranging from X-Small to 4X-Large, so you’ll easily find the right size for you, regardless of your body shape. Moreover, most customers who ordered the jacket said it fits as expected, so we suggest picking your regular clothing size. It is made of superior quality leather that won’t scratch or tear after a couple of uses, so you can rest assured your investment will pay off. The item also comes with plenty of pockets and adjustable zippers that enable a fully customized fit and plenty of room to store your essentials, including your phone, keys, and wallet. This affordable item is available in three different sizes, so make sure you measure yourself correctly before ordering it online. It is made of soft and top-quality leather that is resistant to tearing and wearing, looking like new even after multiple uses. It is quite thick so it will keep you protected against winds, extreme sunlight, and even rain. Therefore, you can use it from early spring until late autumn. It is perfectly vented so it will keep your body cool and dry, even when it’s 80 degrees Fahrenheit outside. It doesn’t come with adjustable cuffs but the slim fit design is closely cut to the body, preventing the wind from penetrating. However, it does feature an adjustable size lace so you can easily wear your favorite biker shirts underneath. There are two large front zippered pockets that act like hand warmers, and two additional smaller pockets around the chest area, where you can keep your phone, wallet, and keys. This product comes in three different color combinations, including one with black and pink when you want to channel the girly part of you. It is available in numerous sizes, so finding the right fit won’t be a problem as long as you measure yourself correctly prior to ordering the jacket. The item is made of soft naked cowhide leather that is 1mm thick, providing you the perfect balance between protection and increased flexibility when riding your bike. Thanks to the outstanding thermal liner, the jacket will perfectly seal your body temperature, keeping you away from cold and high humidity. It comes with chest, back, and shoulder vents to ensure improved air circulation during the spring in order to keep your body cool and dry throughout the day. It also comes with contrasting hood and sleeves made of a soft cotton blend fabric for a touch of coziness and comfort. If you’re looking for an elegant and fashionable leather jacket for women, this item is definitely worth mentioning. It comes in nine different sizes, ranging from X-Small to 4X-Large, so you can easily find the perfect fit, no matter your body configuration. The item is made of soft and extremely comfortable genuine leather that is 1.3mm thick, enough to keep you protected from heavy winds, rains, and harmful sun rays during the hot summer days. The full sleeves feature a functional zipper to ensure you get the perfect fit and also a proper ventilation for your skin when it’s hot outside. It also comes with a half belt attached to the waistline to help you achieve the right fit according to your own desires. Therefore, you can wear the jacket with just a shirt underneath or put on a warmer sweater. In the front, the product displays three large functional pockets with zippers to help keep your hands warm and your essentials safe when riding. Who said bikers can’t be fashionable too? This gorgeous leather jacket is proof that you can benefit from a top-quality and modern design for a decent price. It comes in eight different sizes, including extreme sizes like 4X-Large and 5X-Large so you’ll easily find the right fit for you. The jacket is made of thick grade leather that will keep your body and arms protected from heavy winds, rainfalls, and sun rays. The half belt around the waistline allows you to adjust the product according to your needs so you can wear your favorite clothes underneath, no matter how thick they are. On the front, the item displays three large zippered pockets to keep your hands warm and store all your essentials – including keys, wallet, and phone. 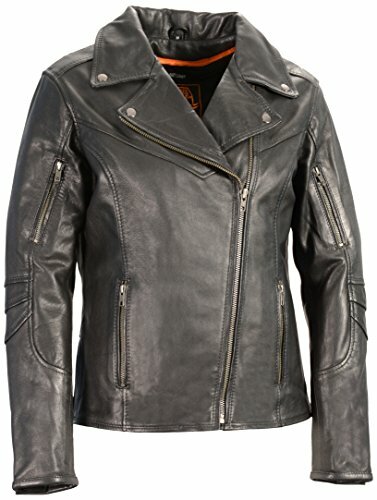 The close cut fit of the jacket will provide a classic and modern look at the same time, while the added studs and the leather laces on both sides will go perfectly with your biker attitude. 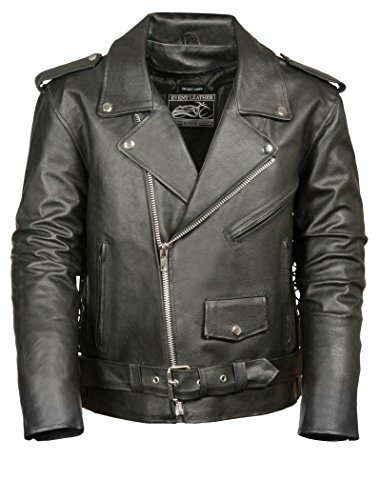 Finding the perfect biker jacket for sale is not an easy task, especially since there are so many cool products on the market. A statement piece of clothing, the leather jacket offers you a modern and ageless look and perfectly compliments any look, be it elegant or more on the rock side. So how can you make sure you choose the best leather biker jacket for you? Carefully read our following buying guide and identify the features you consider as the most important in your quest. When looking for a good biker jacket, you need to buy the one that is perfect for your riding season. Keep in mind that the thickness of the leather used is extremely important as it will provide improved protection against harsh weather conditions or, on the contrary, be more lightweight and allow your skin to breathe properly. Usually, a motorcycle leather jacket for spring or summer is lighter and, therefore, provides improved mobility when wearing it. The leather is softer and thinner at the same time, making sure you receive the optimum protection without keeping you too warm. On the other hand, jackets that are made for autumn usually come with a leather thickness of 1.3-1.5mm and are heavier. They offer maximum protection for the top of your body, arms, and neck, and are usually treated with a waterproof and UV coating to prevent water from getting to your skin or the sun rays from burning you while riding. Another thing to look for in a brand new motorcycle jacket is the right size and fit according to your own style and body shape. Bear in mind that such a jacket should not only keep you warm but also protect you from minor accidents, impacts or scratches. It should also allow you to move freely, especially around your shoulder and elbow area so it won’t interfere with your riding. However, choosing the right size is not always easy so you need to carefully check the manufacturer’s sizing guide and compare your measurements with the ones there. There are plenty of online shops that offer a customized shopping experience and even allow you to talk to someone that can establish the best size for your own height, weight, and body shape. On a regular basis, women prefer a rather close body fit design that will highlight their waistlines and increase their femininity. On the other hand, most men will opt for a rather loose fit or a jacket that is roomy enough to add an extra shirt or a sweater. 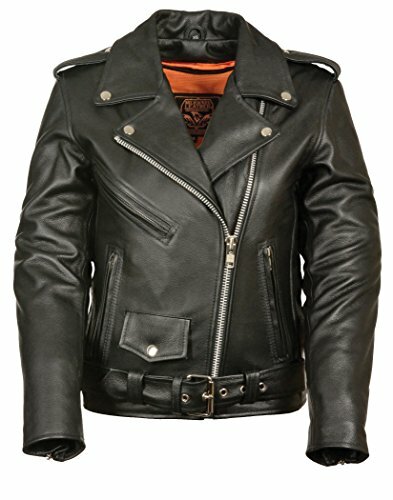 If you’re not entirely sure which product to buy, we suggest that you go through some online biker jackets reviews and see the opinions of other customers. A jacket shouldn’t only look good but also be practical and functional. In our opinion, pockets are crucial when it comes to the functionality of such a clothing item. Most leather jackets come with two large zippered pockets in the front that also act like hand warmers. They are perfect for warming up your hands in harsh weather conditions but also for storing your phone. The keys, wallet, and other personal belongings can be stored in the pockets around the chest area which are slightly smaller but also protected with zippers. 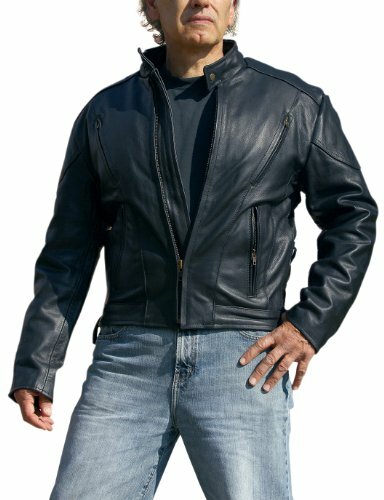 Most leather jackets for men will also come with one or two inside pockets that can safely keep the rest of your motorcycle accessories or personal valuables. Zippers are also important and they should be made of stainless steel or metal and come with an anti-rust coating. It is important to always have access to your personal belongings so never buy a jacket that comes with plastic zippers or studs instead of zippers. 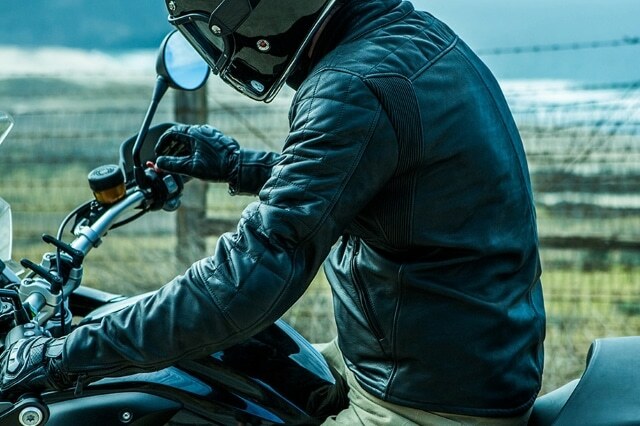 A cheap biker jacket might sound like a good investment at the beginning but it could cost you your safety in the long term. Mesh straps or additional pieces of breathable fabrics ensure a proper ventilation and will prevent your skin from getting hot and sweaty. Lastly, you should also consider some bright designs or reflecting stripes and prints on your jacket. These will improve visibility during the night or on foggy days and can even help you prevent an accident. Don’t forget to complete your look with a brand new pair of motorcycle jeans. And if you’re thinking about some reliable and affordable Harley Davidson gift ideas, then a pair of statement motorcycle winter gloves is a great idea.